For those looking to Study in Canada as international students, our Post Graduate Work Permit ( PGWP) program has a major advantage over many other countries. The ability to spend up to three years working in Canada after completing your degree or diploma gives a good chance to earn money, establish yourself in a career track and, if you have interest, gain work experience towards permanent residence. If you are an International Student in Canada already, getting to the PGWP successfully is really important. The first consideration is ensuring you are studying in a program that is eligible for the PGWP program. Most private colleges in Canada are not eligible for this program. There are some exceptions but they are rare. For a three year work permit to be issued, it’s important that the course of study is at least two years. This can be complex for accelerated programs, programs without breaks, or programs that offer overlapping credits and exemptions. Finally its important to continue full time studies for the duration of time in Canada, and be sure to follow the correct program deadlines and status requirements to ensure a successful application for a post graduate work permit. Now that we are into 2018, lets take a look back at Express Entry scores and trends for the 2017 year. There were 25 rounds of invitations in 2017 for the core programs, and it lead to 84, 685 Invitations to Apply ( ITAs) being issued. The average score for these draws was 438. We did see three rounds where the selected score was much lower than in previous years, as low as 413. It is very hard to predict what level of score would be selected, but it is clear that 2017 saw that mark drop significantly below the 450 range of the previous years. We also saw 2 program specific draws for the Federal Skilled Trades class which is integral to the success of that program. Trades application require lower English scores and are less likely to see the same education points so it was great to see rounds with CRS scores of 199 and 241 to facilitate some success for those applicants. 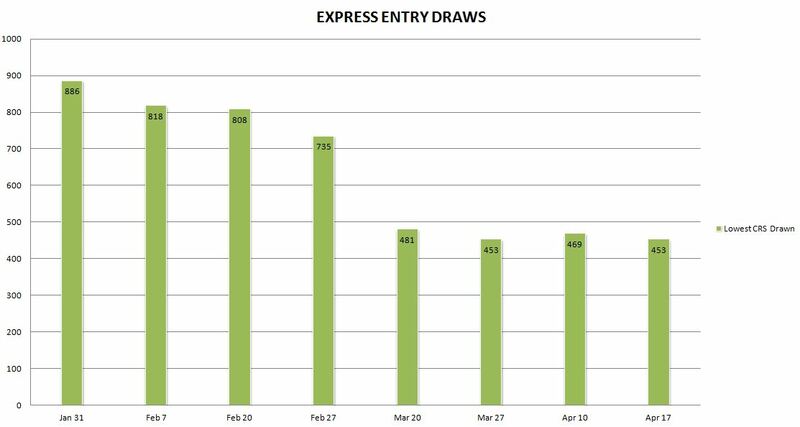 On Sept 21, the most recent round of Express Entry invitations saw the volume rise substantially for the second round in a row, and the Comprehensive Ranking Score (CRS) down to its lowest level since July. 1288 Invitations To Apply (ITA) were issued with a of 483. 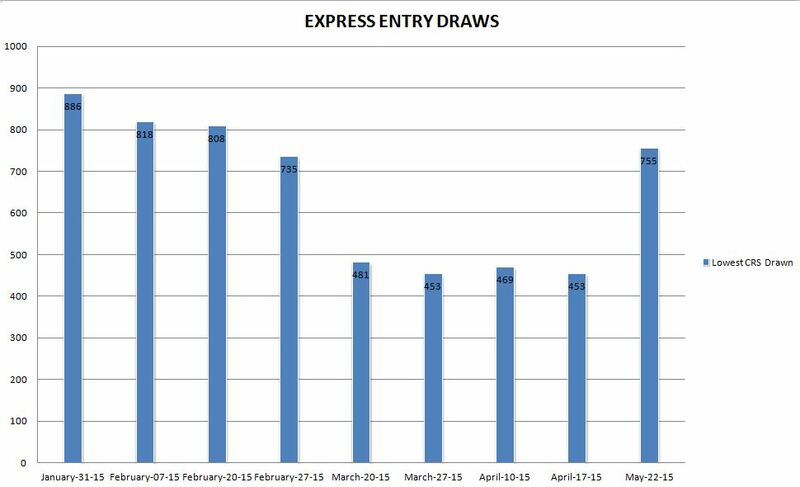 The Express Entry system had really stagnated over the summer, with the volume of invitations was down and scores required were well up. Express Entry is merely a numbers game – the more invitations issued the lower the CRS goes. The trend to watch for this fall is less about the scores, and more about what volume of ITAs are issued. If the number can stay well above 1000 every two weeks, the scores should start to trend lower. If we see rounds at 2000 then I predict we are on track to see the score start to move below the 450 mark for the first time. Clients applying for Permanent Residence in Canada are required to provide Police Clearance Certificates for all countries that they have lived for six months or longer after turning 18 years of age. Immigration, Refugees & Citizenship Canada’s instructions are generally that this is not required from Canadian police unless they request it. Visa Officers can request a CPIC check ( Canadian Police Information Centre ) based on the applicant’s name and date of birth, but in many cases due diligence requires a fingerprint based check. Fingerprint based checks are in order to ensure the identity of the applicant. Canada retains fingerprint records, not only of those convicted of crimes here, but also refugee claimants and those that have been deported from Canada in the past. Canada is also now collecting fingerprints from many applicants for visitor, work and study applications at our visa offices outside of Canada. A fingerprint record is not only a criminal check, but also rules out that an applicant is using another identity after having previously being unable to stay in Canada. In our experience with Permanent Residence applications, requests for a fingerprint based RCMP certificate are common enough that we advise all of our clients to simply get one and have it as part of the original application submission. Our goal for each client is to have an application that can be approved without any requests for further documentation. Requests generally lead to the application slowing done. Here in Waterloo Region, the police can no longer assist with fingerprints for Canadian Immigration applicants. The Waterloo Regional Police may offer to do a record check for a fee of $25 or $30, but these are not useful in any way for immigration as they were not based on fingerprints. Clients should instead see an accredited private agency for digital fingerprints. These can be transmitted to the Ottawa electronically, and allow the RCMP to quickly process an acceptable clearance certificate. We recommend OTS Services in Cambridge managed by Wayne Isbester. OTS Services has provided great service to our clients over the years, and can even ensure that the results are sent directly to our office to add to your file. As a Regulated Canadian Immigration Consultant, I am authorized to represent immigration applicants looking to move to Canada. We deal with many American Citizens often looking to move to Canada as part of a work related transfer, to study or just seeking to move to a new country. In Canada acquiring Permanent Residence is comparable to a Green Card in the USA. It offers, generally, the right to live and work here as you see fit. It is generally permanent but can be lost if crimes are committed, or if too much time is spent outside of Canada. We offer an quick assessment / online consultation session that will allow us to evaluate options for Permanent Residence for a fee of $175. This includes taking in some basic information about you, and then having a 45 minute session on Skype or the telephone to review options. The North American Free Trade agreement allows for Americans in certain occupations to acquire on an expedited basis work permits to work in Canada if offered employment here. Generally speaking these are for 1 to 3 year terms, and while in Canada you can be accompanied by family and receive provincial health care coverage ( ie single payer!). While we are not an employment agency, we can evaluate your opportunities for this if a job lead is presented to us. Canadian Universities offer degrees at the Bachelors level and higher, Community Colleges offer more technical educations, diplomas, post graduate certificate programs and in some cases they can also offer limited Bachelors programs as well. Americans will find that paying International Student Fees at Canadian Universities is likely comparable to paying out of state rates at 4 year colleges in the USA. Undergraduate tuition is generally going to be between $15-20K per year, and that’s of course in Canadian dollars, meaning the current real cost to Americans is $11-14K at the current exchange. This program is the most common method of obtaining residence in Canada under our economic programs. Points are awarded for age, education, language skills, and work experience. This can be a very complex application for determining qualification and navigating the process. 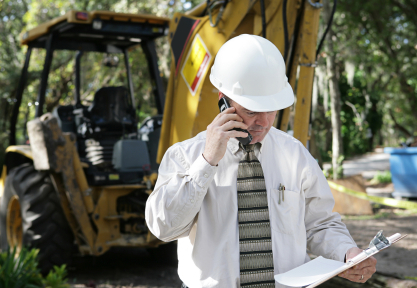 We can work with you to determine your points and what this will mean for your chances. If you want to know more, we recommend getting in touch with us and setting up a consultation session for personalized advice. You can click here for our assessment form to provide us with your details if you are looking for permanent residence information. CIC has greatly slowed down the rounds of invitations for Express Entry. The last draw was 22 May, and that is the only round since mid April. There is speculation that confusion during initial processing of PR applications led to hundreds of applications being deemed incomplete. Guidelines around the validity of Police Certificates are in flux, and it has created logistical barriers for applicants from some countries. Those deemed incomplete were all high scoring individuals, and after having their fees refunded they found themselves back in the pool again. At the next draw in May they were (largely) invited again, raising the required CRS score substantially. As we have said all along, CIC will have to greatly increase the number of invitations, otherwise they will find themselves unable to meet their annual target for new Permanent Residents. At this point it appears that only the backlog of applications from 2014 will bring CIC close to their targets for 2015. At this point in the year, even with a 6 month promise for processing under Express Entry, there is little chance of many more receiving invitations AND having their applications completed this calendar year. Effective 21 May 2015, CIC has simplified the process for service workers entering Canada to obtain work permits, if they are coming in to service equipment on which the warranty has expired. A work permit is still required (unlike warranty service work) and the new employer compliance measures are in place as they are for all LMIA exempt work permits. These are matters that can be arranged quickly though if time is of the essence. If you want to discuss a specific scenario, please get in touch with our office. As we can see above the Comprehensive Ranking Score ( CRS) needed to secure an invitation has dropped considerably since January 31 when the first draw was held. Since the points required are now below 600, Applicants no longer need to have a LMIA Job Offer or Provincial Nomination Certificate in order to be invited. No draws have been held since April 17. Approved Agency for Conestoga College! This means that we have all the details on programs available, and can manage the admission application to help you start a pathway to a fulfilling and successful career in Canada or abroad. Conestoga College in located in the thriving city of Kitchener-Waterloo, and offers a great variety of programs. We can help you understand the options, and the application process. CIC has begun returning Canada Experience Class applications indicating the the annual cap of 8,000 application was met on October 21. This is despite the notices into December that only 4600 applications had been received up to that point. It appears that applications were allowed to accumulate for months without being counted, while the updates posted on the CIC website continued to reflect a number that was less and less accurate each time. Now that Express Entry is active, applicants under all federal economic categories will have intake managed through an invitation based system. This will create a much more straightforward picture on the annual number and is probably the biggest advantage of this new concept.